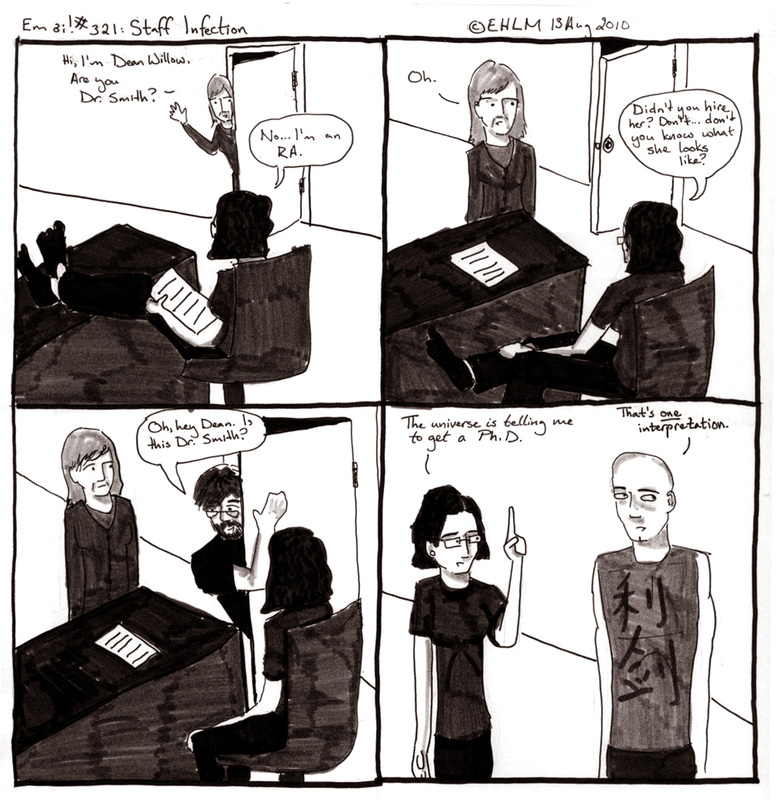 Bryan asked, when I wrote the script for this comic, if the Dean would recognize herself. I told him no, because I’ve changed her name, so she can’t find this. And also, I’ve been introduced to her two or three times now, and I don’t think she knows who I am. I would totally get a Ph.D. if I had a way of justifying it, just because I am totally in love with the intellectual exercise of being an intellectual and reading interesting stuff and writing about it. This is maybe the problem with not being single, I don’t feel like I can just go on getting degrees because I think they would be fun or interesting. There has to be a (pragmatic) reason to do things. In other news, I received my first piece of fan mail from someone who I’m not related to today. (Or, you know, someone I’m friends with on facebook – an email from a random stranger). All of a sudden I feel like a WRITER. I should get these novel revisions done tout de suite. Bryan and I also passed a lovely weekend vacation in Chicago, where we went to the Art Institute, ate a lot of food, and saw some of my favorite relatives. This is filed under LD6115 .L86 2010, for (deep breath): Individual institutions–United States–Wisconsin. University of Wisconsin System–Wisconsin. University of Wisconsin, Madison–Curriculum–Graduate work and courses. I have to agree. The concept of pursuing a PhD has always been alluring to me too. However, I really couldn’t think of a good reason to get it other than to have an excuse to stay in school and a reason that might explain why I hadn’t found more gainful employment. Keep on writing, writer. I am digging it. Glad you enjoyed the writing. I dig your comics, Posky.